It's that time of year again! Hard to believe that it's the beginning of May and we are quickly approaching the start of the 2013 Hurricane Season. June 1st marks the beginning of the year's Hurricane Season, which runs until November 30th. Last year Tropical Storms Alberto and Beryl formed toward the end of May and were reminders that tropical systems can form outside of the typical 6-month season. Forecasters will issue their predictions for the upcoming season by the end of May, but now is the time to start preparing. You've seen me mention this every year, but it is important that you and your family have a hurricane kit and hurricane plan so that when an impending hurricane threatens your area, you are ready to act. This year marks my 10-year anniversary of service to Florida State University. I feel very privileged to have spent the last decade doing something that I absolutely enjoy for a living. Serving as the Assistant State Climatologist of Florida has been an honor, and I hope that I can continue to do so in the years to come. I'm also thankful that I've had the chance to work with passionate weather enthusiasts through the CoCoRaHS Program. Thank you all for giving me another reason to love my job. In a few days, I will be heading up to Estes Park, CO, for the annual CoCoRaHS planning meeting. At this meeting, we will be discussing the future of the program, new tools and databases that will be soon released, cooperation with the NWS Coop Program and more exciting things to come. When I get back, I will pass along some information and outcomes of our 3-day meeting up near the snow-capped Rocky Mountains. Rainfall totals across the state varied in April (Table 1), though most of the state reported totals that were below normal. Localized portions of the northeast Florida, along the Florida/Georgia state line in Columbia, Hamilton, and Madison counties, recorded above normal rainfall (1 to 5 inches), while locations along the Nature and Sun coasts reported rainfall totals 1 to 2 inches below normal precipitation (Figure 1). 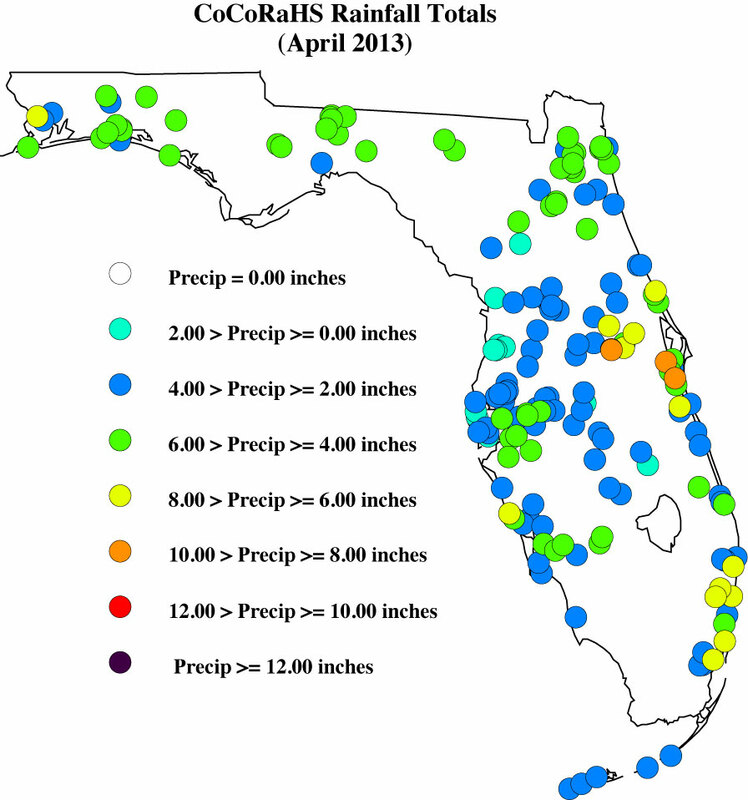 There were a few precipitation records broken during April (Table 2), and portions of south Florida saw heavy rainfall and flooding in some of the metropolitan areas during the month. Most of the counties south of Lake Okeechobee had normal to above normal rainfall, and the lake itself has a level of 13.40 feet, which is down from the high of 16 feet due to some regulatory releases. The 3-month outlooks are forecasting normal rainfall through July, but there is still concern about the lingering drought in the central part of the peninsula. Table 1: April precipitation totals and departures from normal (inches) for select cities. Table 2. Select daily rainfall records (inches) broken during April (Compiled from NOAA, NWS). While the statewide rainfall totals varied greatly across the state during April, there have been some improvements. 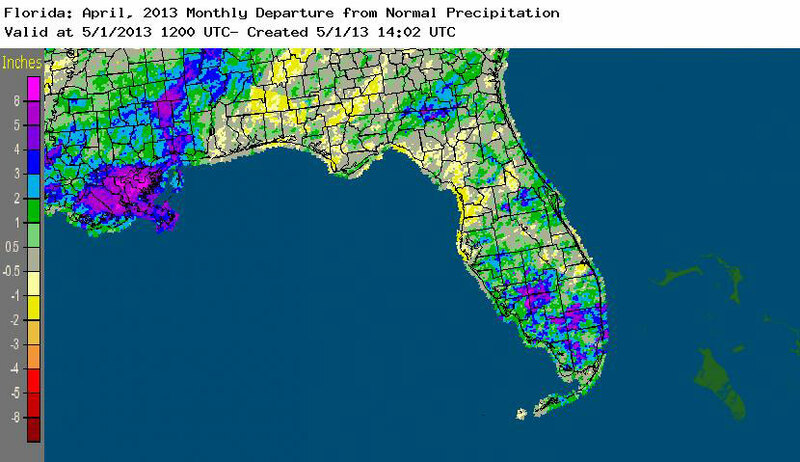 The Florida Panhandle remained drought free through April, though at the beginning of the month, portions of south Florida degraded from dry conditions to moderate drought, before rains set in and helped eased the dryness. 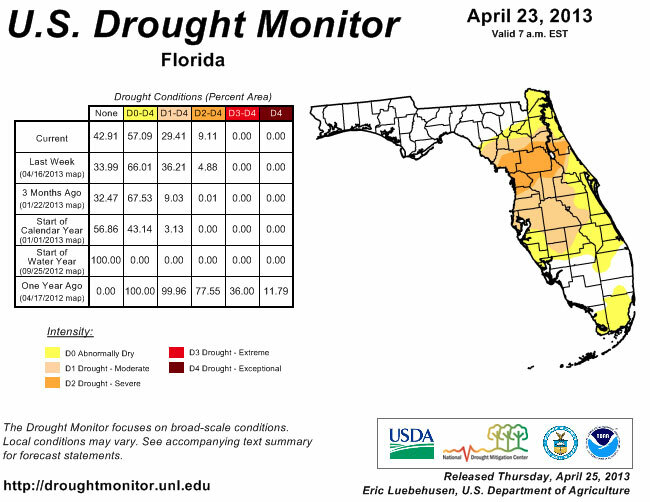 Unfortunately, the dryness of April continued in the central Peninsula, and the region of severe drought spread from Flagler and Putnam counties westward into Marion, Citrus and Levy counties. The beneficial rains at the end of the month helped pull south Florida out of moderate drought and helped either ease the drought in some locations and remove it from others. A few reports in Florida were flagged and required some additional information during April. I appreciate how understanding the contacted observers were, along with how quick they were to reply to my emails, though there are a few outstanding issues that need to be resolved. Please remember: if you receive an email from me with the subject line 'Question About Your Recent CoCoRaHS Observation', please take a moment to answer me back. And if you have any questions, please feel free to contact me.